Holt, Tom. The Good, The Bad, and the Smug. Orbit: 2015. Buy it here as of late July 2015. A witty successor to Terry Pratchett! Just making the comparison should make Holt's day: Terry Pratchett was the acknowledged sage-king of fantedy (fantasy-comedy). The master wordsmith dazzled all with his lingual perambulations (a metaphor that doesn't really make sense, but what did you expect? I'm no Terry Pratchett, after all! ), and the fantasy/comedy world felt his loss keenly indeed. For myself, I've been searching for, if not a replacement, than at least a worthy journeyman successor to Pratchett, and judging from the comedic antics of The Good, The Bad, and The Smug, I may have struck gold with Tom Holt. 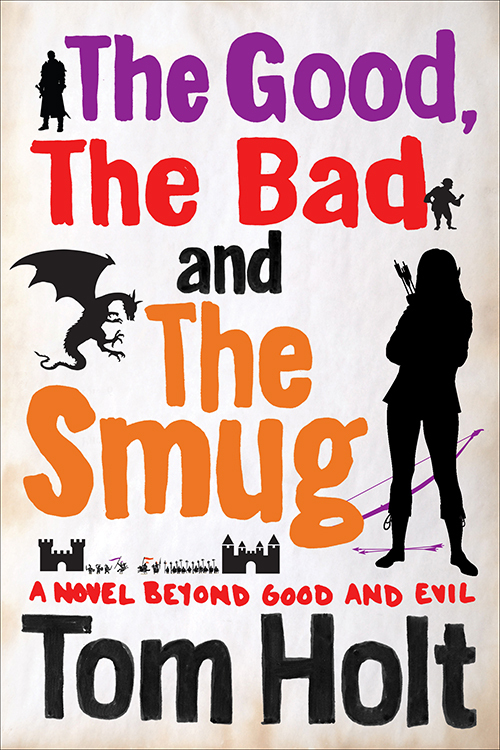 The book is a wittily written yet fairly fast-paced laugh-out-loud action-packed exploration of both the nature of good and evil and the possibility of multiple worlds (possible due to what Pratchett would have called "quantum", with references to the "space time continuinuinuinuum"). While not quite at the finely polished level of Pratchett's mature works in the Discworld series, for example, Holt's effort is mighty respectable. You'll chortle aplenty with this book, and though I can't quite recommend it as highly as I would the finest of the Discworld series, Holt has shown he belongs in the same sentence as Pratchett--no small accomplishment! Reviewed by Zhaoyun, who, in addition to contributing to Nerds of a Feather since 2013, has been thoroughly enjoying fantedy since first discovering Terry Pratchett like a gazillion (okay, maybe 15) years ago!